I used ALDO Got Grapes? as a base, with China Glaze Grape Pop for the designs from the Taco Bell cup, then I used Sally Hansen Professional Lavender Cloud as a base for the Taco Bell 'bell', with Sally Hansen Vavoom Violet over it for the hot pink. Topped everything off with 2 coats of Seche Vite top coat. Also- today's eyeballs. I used (all MAC) Mutiny pigment with Violet pigment in the crease, Rich Purple in the outer corner, and Electric coral on the lower lashline and inner corner/crease. Blue Peep on the waterline, and Blacktrack to line. Ok, that's just making me hungry! cool nails but i loathe taco bell! I flatter myself, but did my comment yesterday inspire your Taco Bell nails by any chance???? : ) Have you tried their new "diet" menu? It doesn't have the cheese, but how is that different from the regular tacos with the single digit cheese shred count, really? Yo quiero queso! Hey, have you ever done chihuahua nails? Like each finger a paw and the thumb is the head? My dog is requesting that! I miss way back in mid to late 90s? when they did the whole "meat taste thing" and changed up the spice recipe for the ground beef. Changed things FOREVER... hated it since (though I will still eat there from time to time...). BWHAAAA!! Wendy's hamburger is a 'square' meal!! Too funny!! You're nail art is amazing!! 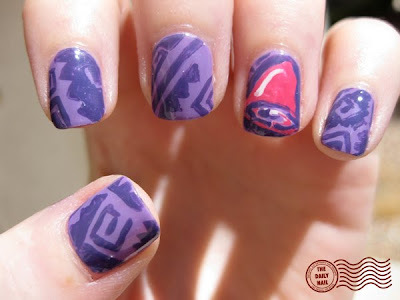 Hey - you should do a wendy's mani w/ frosty and fries and....well, no matter what you do, I just love your creativity!! Haha, I have to show my husband this! Those colors are just adorable! Oh man. I'm in Germany for a study abroad semester and I miss T-Bell SO MUCH. It's pretty much the only thing I miss about the States. Okay, so the nail club at Narbonne High school sent you an email with that nail. I was hoping you would have given them a shot out with the nail. A little disappointed since you were their nail idol. You know I love it when your nails are short. I go by the Bell almost every day during my lunch break, it's such a guilty pleasure. Very cute nails! I'm also loving that you're posting your eye makeup now, very good stuff. As for Andrea Camarena & Anonymous- I didn't get the email that you are talking about, and if I had, I'd have given a 'shout out' as you have seen me do on every other nail design requested/inspired by someone besides myself. Before you are so quick to accuse, make sure that I've gotten the email first. I went back through my emails (including Spam) and didn't receive any emails about Taco Bell nails or with any pictures of them. Send me them, I'd love to see the pictures! I'll even add them on the end of this post if you send them. As for my inspiration on the Taco Bell nails, I have a Taco Bell cup on my nail desk that gave me the idea. I eat Taco Bell about 3 times a week at least, too. Every woman likes to enhaChristian Louboutin shoesnce heRay Ban sunglasses aesthetic beauty. Following gucci bootsthe latest fashion trends and makiChristian Louboutin bootsng style statements is a part and parcoach outletel of their existence. Along side dresses, sareeugg bootss, jewelry, sandals etc hcoach handbagandbags havchanel bagse coach totesgained immense importance in any woman’s wardrobe.diesel jeans So if you are headed for a wedding draped in True Religion Jeansthe best saree then you would beTrue Religion Jeans maklevis jeansng a fashion faux pas if you are not carrying a matching bag. Fashionspyder jacket Indian bags have been given a new lease of life. GHD IV Salon Stski pantsylerTimes have changed and now people prefer buying the best bags firstugg bootsand then go ahead to buy apparel wspyder ski wearhich will compliment it.